The words Tamil Nadu literally means ‘The Land of The Tamils or Tamil Country’. The State of Tamil Nadu is the 11th largest State out of the 29 states of India. But what Tamil Nadu lacks in size, it gains in its abundance of natural resources. 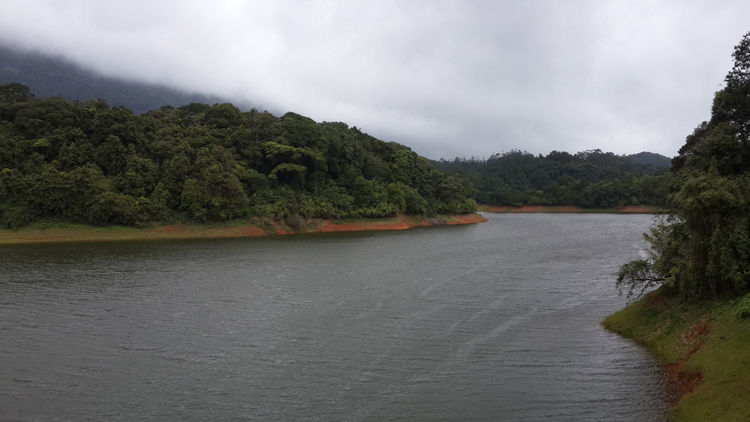 The western, north-western and the southern parts are abundant in vegetation since they’re the meeting points of the Western and Eastern Ghats with the Nilgiris Hills. This makes the state an ecological niche which gives the State of Tamil Nadu abundance in flora and fauna. Tamil Nadu has also been home to the oldest of civilizations, and has seen the rule of various ancient dynasties like the Chera, Chola and Pandya which ruled the region between 300 BC – 300 AD. The state of Tamil Nadu is thus rich in both the aspects of Cultural and Natural making it a tourist haven. In this article we shall discuss about the 10 popular places you must Visit in Tamil Nadu. Famous For: Temples, Beaches, Culture. 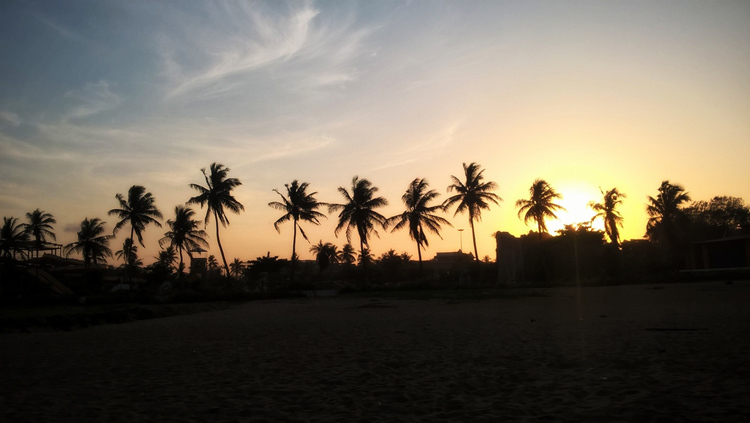 Major Attractions: Marina Beach and Kapaleeswarar Temple. Formerly known by the name Madras, Chennai is the Capital City of Tamil Nadu. The city has been surrounded by the South Indian Kingdoms since ages, thus it has always been the forefront of all cultural, economical, social, commercial and industrial development in the south of India. Chennai is the short form of the actual name Chennapatnam. It’s often nicknamed as the Detroit of India, due to Chennai housing the majority of India’s Automobile industries. Not only industries, the city is famous for its distinctive culture and heritage as well and you might need to take around 2-3 days to properly explore this city alone. The city houses more than 20 heritage structures including railway stations, Museums, Book Shops, Cinema halls and many more. Chennai is also famous for its clean sandy beaches, parks, temples and cultural centers. There are various shopping attractions here and most sorts for Modern Day Activities one can name. With a big list of tourist attractions, Chennai is aptly the 3rd most visited City by tourists after Delhi and Mumbai. Chennai International Airport in the city is the nearest airport. 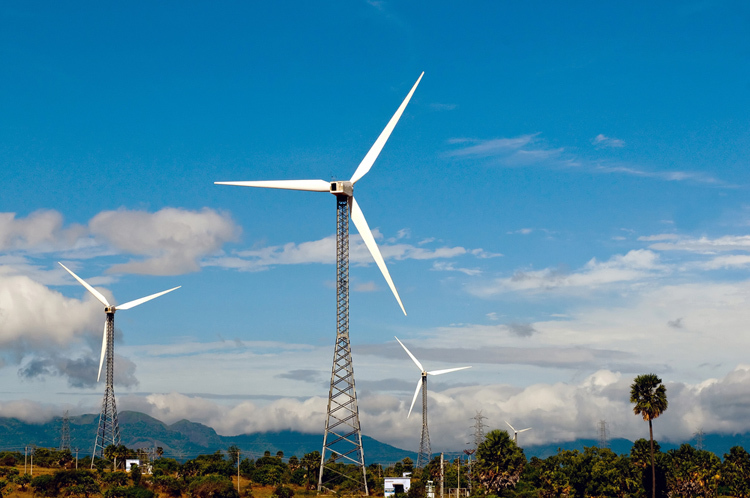 It has good connectivity from all states of India and is even connected to other nations. Take a cab or bus from the airport to any part of the city. Chennai Central station (MAS) is not only one of the most prominent railway station of India but it also has along line of history behind it, since the colonial times. It is connected to all states of India and a cab or bus can be taken from here to any part of the city. Chennai Mofussil Bus Terminus is connected to all cities in Tamil Nadu and also to neighbouring states. Many private and state run buses pass through this station. 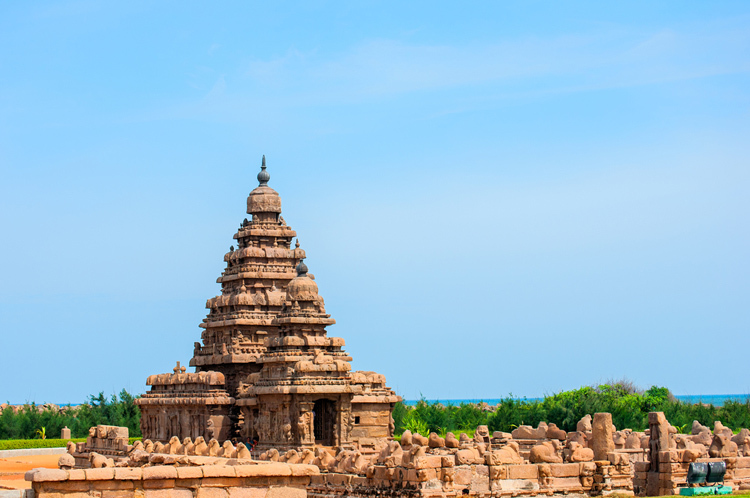 Major Attractions: Shore Temple and Pancha Rathas. Also known as Mamallapuram, the city of Mahabalipuram is famous for its ancient and cultural heritage. The city of Mahabalipuram was a prominent seaport dating back to 7th century AD and was ruled by the Pallava Dynasty. The place is famous for its monuments and is classified among the UNESCO world heritage sites. 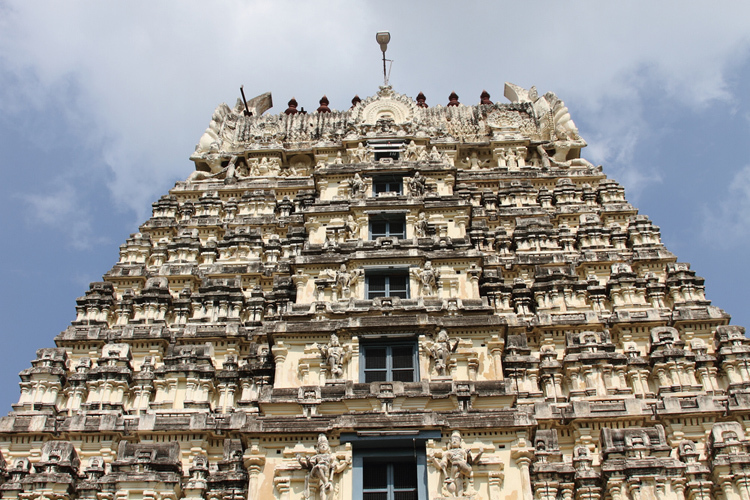 Almost all of the monuments are carved out of Granite and display the brilliance of Dravidian style architecture. The town is otherwise a small one and the best way to get around it either by foot or bike rental. The attractions in the whole town can be covered in a day or two. The city is bustling with tourists most times of the year except monsoons. The amazing location of this place adds to the charm of the monuments and the intricate carvings. The temples here are a marvel to behold and with the aid of a knowledgeable tour guide one can totally get lost in the ancient stories behind each of the monuments. Chennai International Airport about 53 kms away (1 hour) from the city is the nearest airport. It has good connectivity from all states of India and is even connected to other nations. Take a cab or bus from the airport to any part of the city. Chennai Central station (MAS) in Chennai is the nearest railway station about 58 kms away (close to 1 hour). It is connected to all states of India and a cab or bus can be taken from here to any part of the city. MTC (Metropolitan Transport Corporation ) and TNSTC (Tamil Nadu State Transport Corporation) run buses to and fro Mahabalipuram at regular intervals. 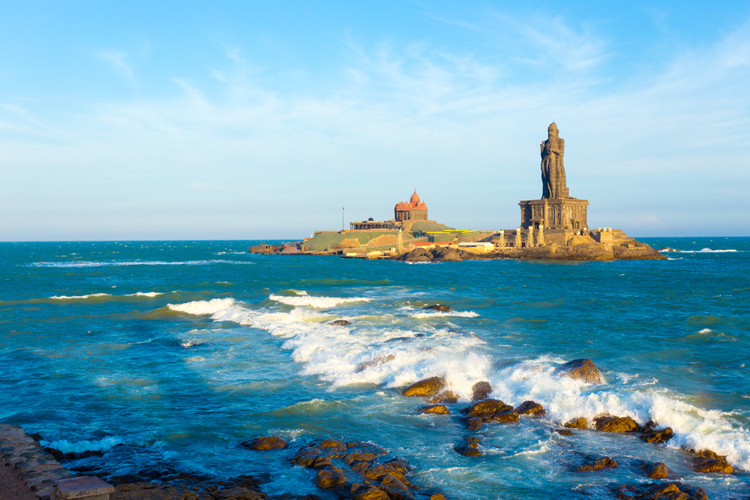 Major Attractions: Thiruvalluvar Statue and Vivekananda Rock Memorial. Kanniyakumari railway station (CAPE) in the city is the nearest railway station. It is connected to all states of India through a stop over at Chennai Central station (MAS) and a cab or bus can be taken from here to any part of the city. TNSTC (Tamil Nadu State Transport Corporation) runs buses to and fro Kanyakumari at regular intervals. Major Attraction: Meenakshi Amman Temple. The 3rd largest city in Tamil Nadu, Madurai is also one of the oldest inhabited cities in the world. The place has been mentioned by many such as Kautilya and Megasthenes. The city has been ruled by both the Pandya and the Chola dynasties. The city houses a number of important and magnificent temples that it is built around. Geographically the city of Madurai lies on the fertile plains near the river Vaigai which divides the city in two parts. The land is thus mainly used for agriculture and the major supplier for paddy crops such as rice in India. The majority of tourists who come to Madurai come to visit the various temples that enshrine this ancient city. 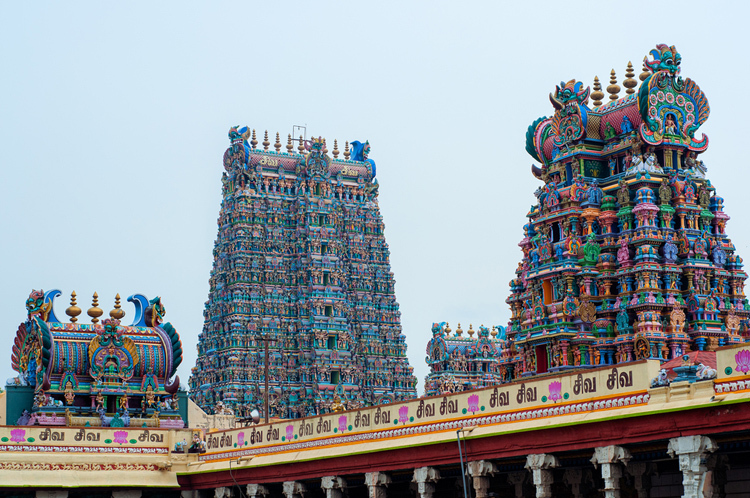 The Meenakshi Ammam Temple is of prime importance here as it has been mentioned in almost all the ancient texts and is considered as the prime pilgrim spot for the Tamil people. The Temple complex consists of 27 different temples and the highest tower with the height of 51.9 meters high crowns the place. Many different monuments and temples are also a must visit along with the various festivals celebrated here. The town of Madurai is a spiritual experience in itself. Madurai Airport in the city is the nearest airport. It has good connectivity from all major cities of India. Take a cab or bus from the airport to any part of the city. Madurai Junction (MDU) is one of India’s highest booked railway stations. It is connected to all states of India and a cab or bus can be taken from here to any part of the city. Being a major pilgrimage center, Madurai has three main bus stations for inter city and intra city transports, these are: Mattuthavani Bus Terminus (MIBT), Periyar Bus stand and Arappalayam. NH 49 and NH 7 are the main national highways passing through this city. Famous For: Hill Station, Nature. Madurai Airport in the city is the nearest airport with the best connectivity, about 3 hours away (116 km). It has good connectivity from all major cities of India. 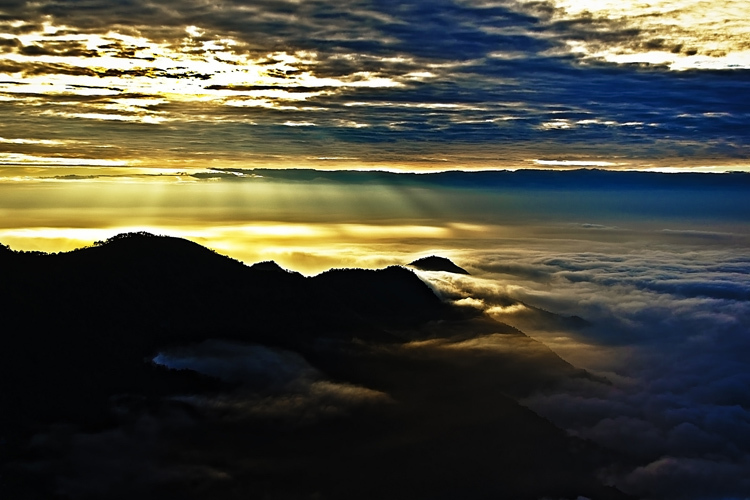 Take a cab or bus from the airport to Kodaikanal. Madurai Junction (MDU) about 3 hours away (114 km) is the nearest railway station. It is connected to all states of India and a cab or bus can be taken from here to any part of the city. The next option can also be Palani Railway Station (PLNI), about 64 kms away but it has limited connectivity. Many people prefer to take a road journey to experience the long winding roads, surrounded by forested areas. Madurai Arapalayam bus stand has many buses passing from other cities. Famous For: Forts, Temples, Education. Major Attractions: Vellore Fort, Jalakandeswarar Temple. Also known as, the Fort city, Vellore is located at the banks of Palar River at the North-eastern part of Tamil Nadu. The city came under the reign of various kingdoms and monarchies such as the Pallava, the Chola, the Carnatic Kingdom and the British. The place’s name comes from the Monolithic fort of Vellore which was built in the 16th century by the Vijaynagar Kings and is constructed out of granite. The fort complex has a Christian church courtesy the British, a Mosque and an old Hindu Temple which has some of the most magnificent carvings. The place has a lot of historic relevance as well, as the fort of Vellore is said to have housed Tipu sultan’s family during the British Rule. Apart from the fort there are several other attractions that have made it an important tourist destination. The various temples with a brilliant display of carvings and Dravidian Style architecture, the picturesque hill station of Yelagiri, the churches and mosques and various shopping hotspots has made it a must visit place in Tamil Nadu. Tirupati Airport is the nearest airport about 3 hours (129.7 km) away and is connected to all major cities of India. Another option that can be considered is Chennai International Airport, about 3 hours (135.7 km) away. Though there are three railway stations in the city, Katpadi Junction railway station (KPD) is the major railway station lying on Chennai-Bangalore railway lines and therefore, it is connected to all major cities in India. Vellore Cantonment (VLR) is another option to consider. Vellore is connected to neighbouring states and almost all cities in Tamil Nadu through NH 4 and NH 234. Famous For: Nature, Hill Stations. Major Attractions: Government Rose Garden and Doddabetta. The Capital of the Nilgiris District, Ooty or Ootacamund is one of the top visited hill stations in India. 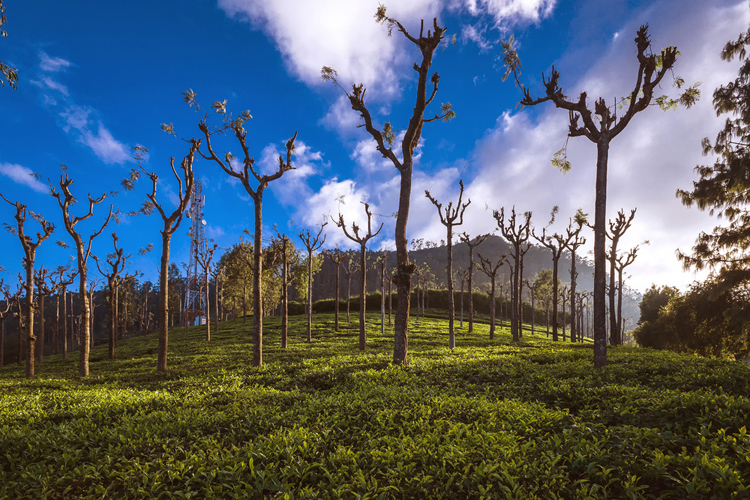 The place lies in the heart of the Nilgiris Mountains with an average elevation of 2,240 meters above sea level. The place is characterized by the blue smoky mist from the thick eucalyptus forests and is also known to house the rare kurunji flower. The town’s major source of economy, like most hill stations is tourism. Many officials of the British government described the likeliness of this place to resemble Switzerland. Despite of being located in the tropical region of India, Ooty enjoys a pleasant and mild climate throughout the year, with chilly nights. The best time to visit is between the months of December till February and is frequented by tourists all around. The various lakes, mountains, gardens and valleys are amazing places to visit. The different peaks are great spots for trekking and the lakes make amazing camping and picnic spots. A visit to Ooty and you will experience a surrounding which is unique to almost any place in India. The nearest airport is the Coimbatore International Airport about 3 hrs (86.6 km) from the city. It has good domestic and international connectivity. Take a cab or bus from the airport to any part of the city. Udhagamandalam railway station (UAM) has been in operation since 1899 and is also the part of Nilgiri Mountain Railway which happens to a UNESCO World Heritage Site. It is connected to all states of India and a cab or bus can be taken from here to any part of the city. Ooty bus stand is connected to all cities in Tamil Nadu and also to neighbouring states. Many private and state run buses pass through this station. The city of Kanchipuram is located on the shores of the Vegavathy River. The city has seen a number of ruling dynasties and monarchies such as the Pandya, Cholas, the Vijaynagar Empire, the Carnatic kingdom and the British monarchy. Kanchipuram since medieval times has been significant as the educational center and was known as the place for learning. The city is also famous for its various temples that are built in the Dravidian style of architecture and display amazing stone carvings. 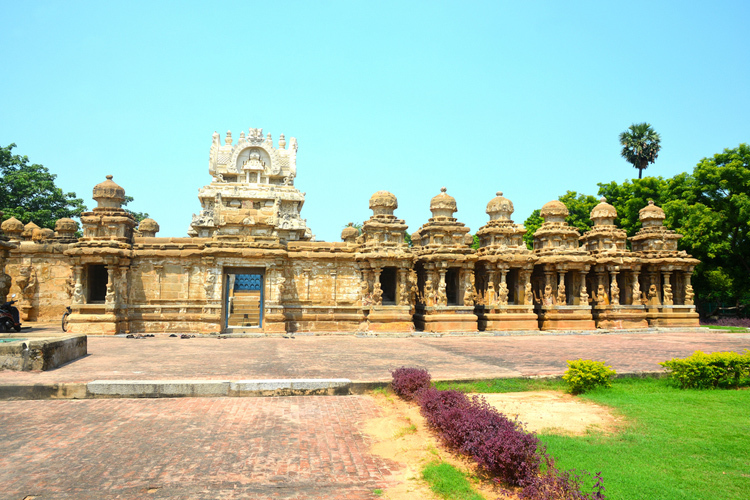 Kanchipuram has been an important city and has been mentioned in texts dating back to the Maurya Period (325-185 BC) and has been constantly mentioned as a city like no other in the Dravidian Kingdom. Kanchipuram apart from its various temples is also known for its medicinal herbs, this fact has been vouched for by the ancient texts as well. One of the major products of Kanchipuram is its specialized silk and more than 5000 families residing here are involved in silk weaving and famous for the “Kanchipuram silk Saris”. The place is rich in both natural and manmade attractions and has a distinct culture that one must experience. With its various Temples, bird Sanctuary, beaches, backwaters etc. makes the city a must visit. Chennai International Airport about 2 hours (73.9 km) from the city is the nearest airport. It has good connectivity from all states of India and is even connected to other nations. Take a cab or bus from the airport to any part of the city. Kanchipuram railway station (CJ) is the nearest railway station. It is connected to all states of India through a stopover at Chennai and a cab or bus can be taken from here to any part of the city. NH 4 provides good connectivity to Kanchipuram and Tamil Nadu State Transport Corporation sanctioned buses run frequently here from all parts of Tamil Nadu and neighbouring states. Famous For: Temples, Culture, History. About CoimbatoreThe highly industrialized town of Coimbatore is often termed as the ‘Manchester of India’. It is the second largest city in terms of area in the State of Tamil Nadu. The place is famous for its various temples, shopping hubs and typical Tamil food items. The town of Coimbatore is also surrounded by various picnic spots like waterfalls and rivers which are sure to refresh your senses and are great places to visit with family or friends. The city is located on the banks of the Noyyal River and is surrounded by the Western Ghats. The best thing about this city is its pleasant weather all year round. The thick forest covered mountains and the cool wind from the Palghat gap makes the hot weather a pleasant one. The city also takes pride in housing the Siruvani River which is a tributary of the River Kaveri. The special thing about this river is the taste of the water due to a perfect mix of the minerals making it the second tastiest water in the world after the Nile River (do not buy packaged water when you visit this place). There are various parks and zoos that only add to the large number of tourist attractions present in this city. Coimbatore International Airport is the nearest airport. It has good connectivity from all states of India and is even connected internationally. Take a cab or bus from the airport to any part of the city. Coimbatore Junction railway station (CBE) is the nearest railway station. It is connected to all states of India and a cab or bus can be taken from here to any part of the city. There are five National Highways passing through the city and therefore Coimbatore has a good road connectivity to all cities in Tamil Nadu and even to neighbouring states like Karnataka, Kerala and Andhra Pradesh. Another ancient city in Tamil Nadu, Tirunelveli is famous for its temples. The city is located at the southernmost tip of the Deccan plateau with the river Tamirabarani running through the city. The city is a religious and agricultural hub and thrives on tourism. The place is abundant in natural resources and has a diverse range of physical features like mountain ranges, rivers, sea coasts and forests. The temples here are of special significance as they were created in medieval times by the ruling dynasties of that era and display some brilliant architecture and stone carvings. Apart from being a monumental hub of Tamil Nadu, the city holds numerous undiscovered spots which make it a tourist haven. The forests house a variety of natural flora and fauna along with many rare and endangered species. The best time to visit the place is between October-February when the climate is pleasant and the vegetation is at its peak. The nearest airport is the Madurai Airport about 2 hrs 20 min (157.3 km) from the city. It has good domestic connectivity. Take a cab or bus from the airport to any part of the city. Tirunelveli Junction (TEN)is the nearest railway station and is counted as one of India’s most oldest, busiest and important railway station. It is connected to all states of India and a cab or bus can be taken from here to any part of the city. Veinthankulam bus stand is connected to all cities in Tamil Nadu and also to neighbouring states like Karnataka etc. Many private and state run buses pass through here. The Magical State of Tamil Nadu is the second most frequented tourist spot in India. With its abundance in natural and man-made wonders the city has more than 4000 years of cultural history. Apart from the places mentioned above, the hill stations of Coonoor and Yelagiri are also popular amongst the tourists. Also, Rameswaram and Tiruchirappalli are also popular tourist destinations of Tamil Nadu. Most of the sites and monuments from the ancient era have been well preserved along with the natural resources which make it a definitive tourist attraction. My name is Cyril. I am planning to visit Chennai in November but I am a bit confused about the places to visit near Chennai in outer Chennai. Our plan is to visit Velankanni Church and then we want to see all the famous places and beaches around. We have a family of 5 / myself / Parents (both are above 60 ) two sisters. Hi Am Shobana… Good to hear from you.. Visit Marina beach,Elliot beach, Besant Nagar Temple, Express Avenue Mall, Forum Mall, Chennai City Centre, Valluvarkottam, Skywalk, Mylapore Saibaba temple,Escape cinima, T.nagar, Usman Road, Semmolzhi poonga.. Dony miss it.. Have fun..!!! The best option is for you to take ECR road to Velankanni, On the way you can start with Marina Beach, Ellitot Beach , Adayar Velankanni church is there and close by you can also visit beasent nagar beach… You can then move to covelong beach which is close to mahabalipuram. The artistic beauty of mahabalipuram is amazing and you cant miss it. Pondicherry too is on the visa, just take a break at pondichery. We are also going to visit there in mid November. ? Hope u enjoy the journey. ? meenakshi temple,chidambaram Natarajar temple, tanjore temple,sri rangam temple ,golden temple vellore,isha temple covai ,mahabalipuram beach temples ,mainly tiruchendoor murugan temple etc. wow..can you please guide me for the same. Thanks for the appreciation Vaishali! hmmm.. You tell me a place is nice place. I am going to Srirangam temple. I visited Trichy. But Chennai is nice place and more important place. You missed Chennai city, the 1st modern city. But Srirangam is old temple in our Trichy City Sollunga. I am planning to visit chennai on 1st week on aug, my first priority is to visit balaji temple…kindly let me know how long should i stay and what are the places i can see on short tenure. how many days we need for sightseeing in Tamil nadu. please suggest me route for 10 important sightseeing places in tn. I will be travelling from Hyderabad. I am visiting in Tamil Nadu places so describe any tourist for protect any blog presentation in the websites. We are planning to visit Rameswaram, Ooty, Kodaikanal and Kanyakumari on April. Please help us on how to start and how to travel these places one by one. Its our honeymoon so please help us. We are starting from Bhubaneswar by train. You can start from Kochi (Cochin) then to Munnar to Kumarakom to Alleppy to Kanyakumari to Kovalam to Thiruvanthipuram (end point). Or you can start from Thiruvanthipuram and end at Kochi.